The allergy condition or allergic rhinitis, is one of the most common conditions in the United States though it is often mistaken for the common cold. It is estimated that nearly 40 million people in the country are affected to some degree by allergies and, for many, the suffering continues all year round. Seasonal allergies, more commonly known as hay fever, are caused by a variety of common outdoor allergens. They appear at specific points during the year, varying slightly depending on the weather. This condition is seasonal in most cases and not all sufferers fall victim to all types. 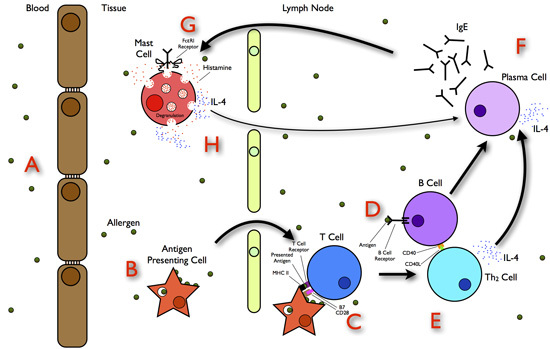 In any event, the illustration above shows the allergy pathway cycle which is more complex than one might imagine. Tree pollens are most common during the spring, as are grasses. Pollens from weeds, such as ragweed, will begin to irritate airways and nasal passages in the summertime and through into the fall. Mold spores can be a major source of allergy problems year round in many states and are found in fallen leaves, mulches, rotting wood piles, and soil. Indoor allergies are caused by a variety of allergens, including animal dander, cockroaches, and dust mites. Also known as perennial allergies, indoor allergies can be present in the many fabrics and materials located within the home, as well as on clothing, pets, and in damp humid areas of the home, such as the bathroom or basements. Both types of allergies have many symptoms in common, including a runny nose; itchy, watery eyes; sneezing, stuffy nose, scratchy throat, and other common symptoms such as asthma, fatigue, and headache. 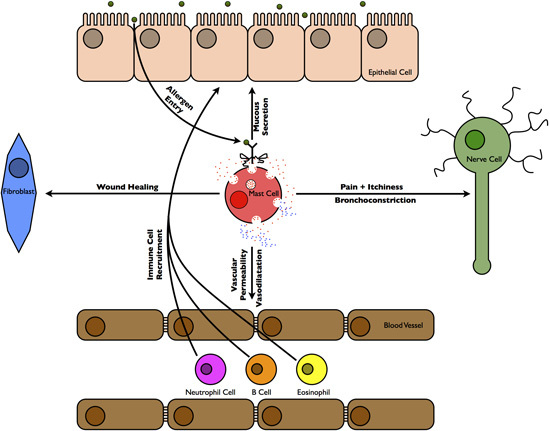 The illustration above shows the various tissues affected in allergic inflammation. Both seasonal and perennial allergies, while not life-threatening, may potentially have an enormous impact on a persons daily lifestyle and habits. The cold-like symptoms common with all types of allergic rhinitis cause sufferers to avoid sports, traveling, and other outdoor activities that could expose them to higher levels of allergens. Social activities and family gatherings can become an ordeal and many people with allergies spend their time watching others have fun as they struggle to suppress the symptoms. Productivity at work and school may also suffer as allergies flare-up. Unable to control the air filtration systems in offices, factories and schools, allergy sufferers may be forced to take sick time or vacation days in order to ease symptoms in a more controlled environment. The expense of allergies may also take a toll on a persons lifestyle, forcing them to choose between purchasing expensive medications to ease and hopefully eliminate symptoms or saving the money and suffering through the onslaught of respiratory and nasal symptoms common to this condition. Every year it is estimated that $1.1 billion dollars are spent on doctors visits for allergy symptoms alone. Nasal allergy medications also eat up a sizable part of an allergy sufferers monthly budget, though many discount cards and services will enable them to buy Nasonex or some other nasal spray, liquid, or pill medication. Outdoor allergy symptoms can be difficult, but not impossible, to overcome. Keeping allergen-rich plants and substances around the home to a minimum is a good first step. Many allergy medications are available over the counter and they can help to suppress and control the symptoms from flaring-up. Pollution indoors can be reduced by using three EPA-approved strategies—control the sources of the pollution, such as carpets, fabrics and pet dander; ventilating to adequate numbers, and finally, cleaning the air. One of the best ways to keep your air as clean as possible is to use a Hamilton Beach 04383 True Air Allergen-Reducing Air Cleaner . Another method that many sufferers have had success with is installing an ultraviolet device in their duct systems.